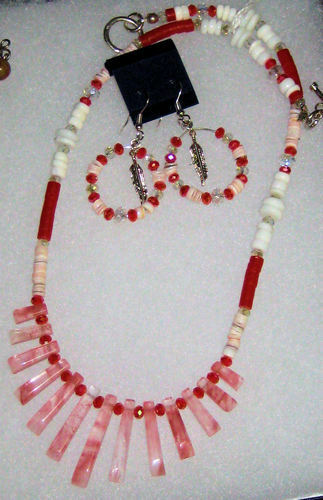 This necklace and earring set is unique and one of a kind with a finished crest of rose agate, crystals, heishi shells and silver settings. 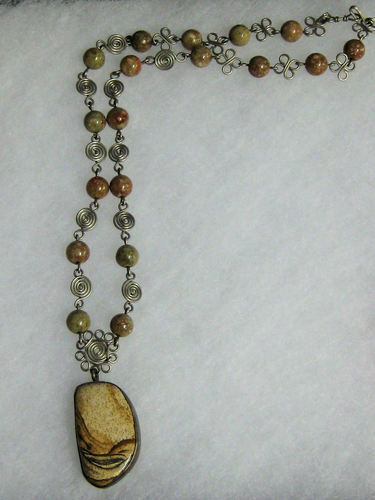 These are Oregon Agates in 14kt Gold Wire Wrap Necklaces. Several other varieties of stones and finishes are also available in both gold and silver. Caryn will be pleased to send you more information and pictures upon request, as well as prices and shipping costs with your phone and address submitted. 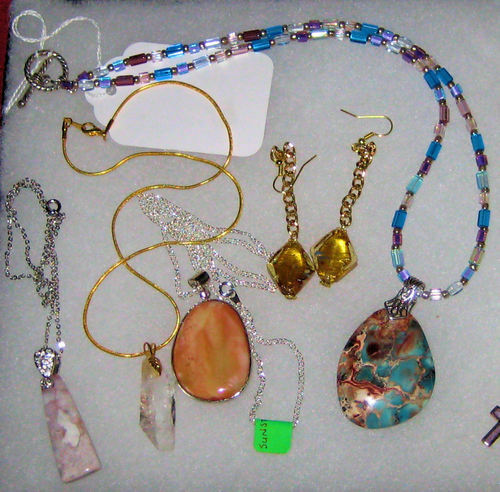 A jewelry variety of necklaces and earrings. All sets are made with stones, agates, crystals, glass beads or a combination with gold or silver spacers or chain. Many other varieties are available. A selection of crystal, glass and silver earrings in different combinations. 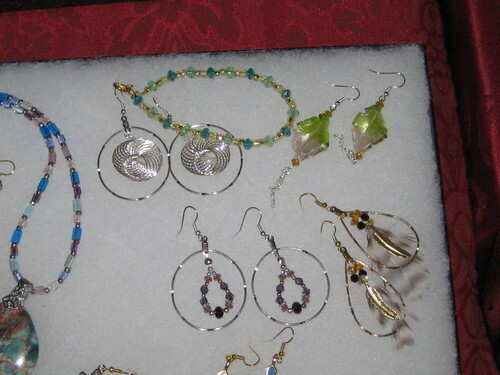 There are all varieties of earrings and pendents and finishes of colors, stones and glass beads. Please feel free to email Caryn for more information and special requests. For purchases payment may be made with pay-pal. With shipping address information a cost breakdown may be forwarded. Please leave your name and telephone number to contact you. Thank you for your interest in my jewelry. I welcome everyone to drop in my shop when travelling in the Okanagan Boundary area. We're located at the Beaverdell RV Park. If you need a place to rest for the night, we offer full services at our RV Park too.